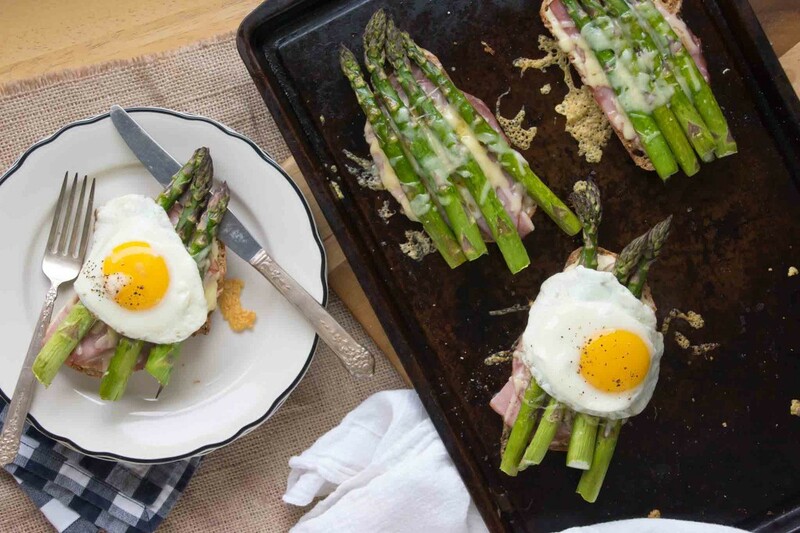 This croque madame is getting a spring makeover with the addition of roasted asparagus. 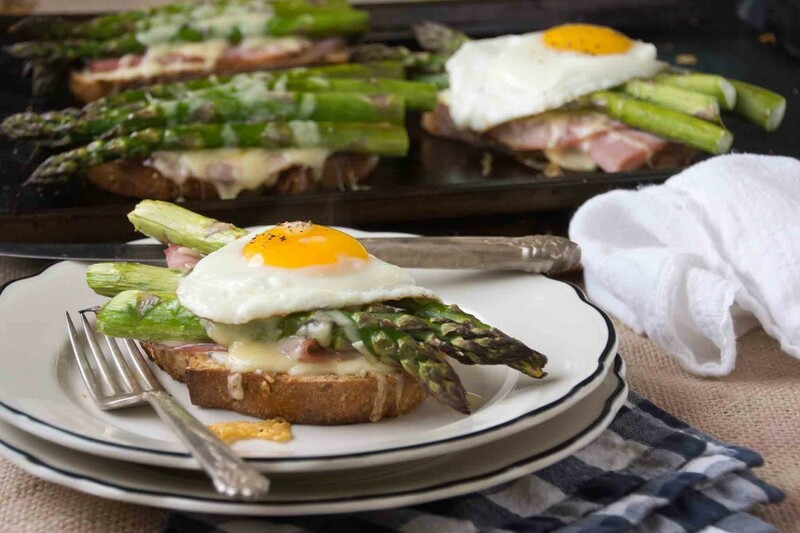 I love ham and asparagus together–it tastes like a mini Easter dinner. We’ll start by roasting off a bunch of asparagus and toasting our bread. I like to use thick slices from a sturdy whole grain loaf. While you’ve got that in the oven, make a thick béchamel sauce, spiked with a spoonful of Dijon mustard. Once toasted, spread the bread with béchamel. Top with a slice of ham and a sprinkle of grated Gruyère cheese. Arrange a few spears of asparagus across the top and finish with a bit more cheese. Put the sandwiches in to bake while you fry a couple of eggs. Try to contain your excitement. 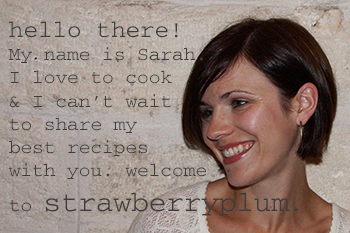 Also, I’m calling dibs on all those crusty bits of cheese stuck to the pan…you should have spoken up sooner! Slide a sunny-side up egg on top of each croque and go to town. This is a fork and knife sandwich. A glass of wine and a linen napkin kind of sandwich. 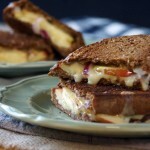 An I-can-deal-with-another-gloomy-day-if-this-what-I-get-to-eat-for-lunch sandwich. 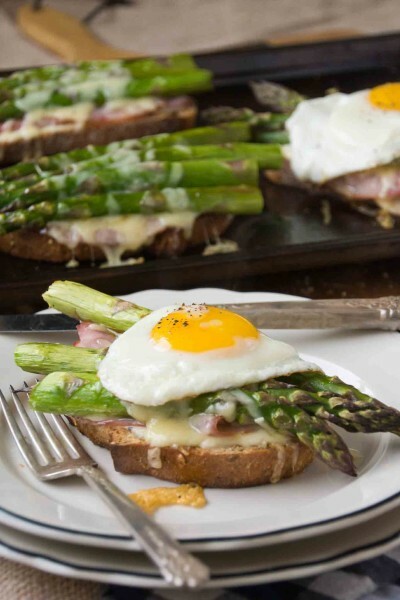 My beloved croque madame gets a spring makeover with a layer of roasted asparagus. 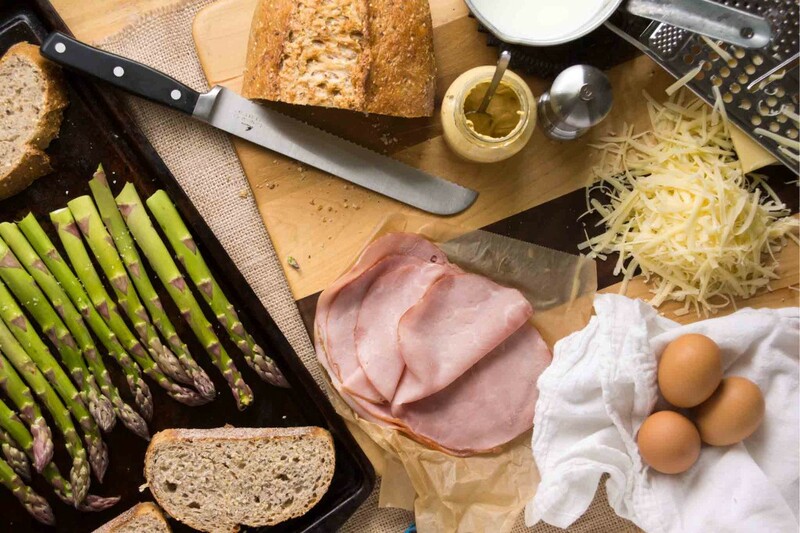 Place the asparagus and bread on a baking sheet. Drizzle a tiny bit of olive oil on the asparagus and season. 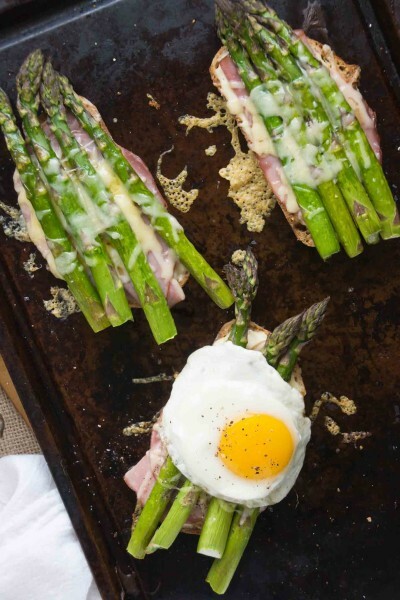 Roast until the asparagus is crisp-tender and the bread is toasted (give it a flip halfway through), about 10 minutes. My asparagus was pretty thick, if your spears are thinner, they'll take less time. While the bread is toasting and the asparagus is roasting, make the béchamel sauce. In a small saucepan, heat the milk to almost a boil. In a second small saucepan, melt the butter until it starts to foam, then dump in the flour and whisk over medium-high heat until lightly golden. Slowly pour in the hot milk, whisking constantly to prevent lumps. Continue to cook over medium heat (still whisking constantly) until it is quite thick, about 8 minutes. Remove from heat, stir in the mustard, and season with salt and lots of black pepper. 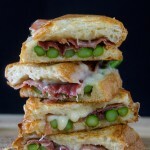 Spread the top side of each slice of bread with a thick coating of the béchamel sauce. Place a slice of ham over the sauce and sprinkle with a bit of cheese. Arrange the asparagus spears on top of the cheese and sprinkle with the remaining cheese. Bake until the cheese has melted and started to brown, 8-10 minutes. While the sandwiches are baking, fry the eggs as desired (sunny side-up looks the nicest!). When the sandwiches are ready, divide between plates. Gently slide a fried egg on top of each sandwich and serve immediately.